Gore is more when it comes to Halloween cocktails. From classics like Bloody Mary to new-fangled libations inspired by the trend for all things vampiric, mixologists are seeing red for the annual celebration of things fun and ghoulish. Chef Richard Garcia of 606 Cingress at the Reanissan Boston Waterfront likes to play on the classics with his Ghost of Mary - a drink where the "blood" of the tomato juice swirls around in the glass. 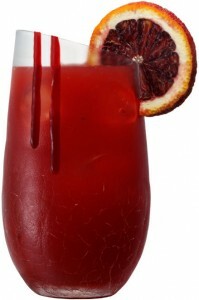 He uses vodka mixed over ice with his own special "ghost mix" of tomato-vegetable juice cocktail, lemons and seasonings, then strained to createan effect of blood swirling around in the glass. For a shortcut, you can just buy some Bloody Mary mix and strain it in a coffee filter to remove some of the solids. "Ghost of Mary is bloody good fun" Says Garcia. "It's a drink with enough kick to haunt you, just the kind of Bloody Mary you want to drink by the full moonlight. In a cocktail shaker filled with ice, combine the scotch, cherry liqueur, vermouth and orange juice. Strain into a martini glass, then garnish with the strip of zest.